That’s been my week – what about yours? Has it been an anxious week for you? Any sleepless nights? In our series on Transforming Church, Transforming Lives, we come to the spiritual discipline of prayer. In Philippians 4, we will discover there is no greater antidote to worry than a conversation with the Lord. First, I would like us to observe the reason for praying regularly. Second, the rhythm to praying regularly. And third, the result of praying regularly. Lets read the paragraph and observe the context. “The Lord is near. Do not be anxious about anything, but in everything, by prayer…” (Philippians 4:6). What is anxiety? The word translated here literally means “to be pulled in different directions”. Thursday, a lady asked to see me. She had three things to say. First, I needed to be a more assertive leader like Revd A. Second, as a pastor I should be more like Revd B and third, I should learn to preach like Revd C. She clearly has the gift of discouragement. What are some of the things that pull you in different directions? People’s expectations, our own expectations, our hopes, our fears, can all pull in different directions. Worry literally pulls us apart. The old English word from which we get our word “worry”, is even more graphic. It means “to strangle or throttle”. Isn’t that what it feels like when you are worried? Paralysed from the neck down? Worry has physical consequences. Headaches, neck pains, ulcers, indigestion, nausea, even our coordination is affected. When Paul says “Don’t worry about anything” he means literally “everything”. Worry is forbidden. Why? Did you notice the context? “The Lord is near” – therefore…. Because from a spiritual point of view, worry is the result of wrong thinking. Knowing the Lord is near in space and time changes our perspective on our circumstances. Worry breeds when we forget the Lord is near. When we worry we are saying “God, you’re not big enough to handle this one.” That is why it is not good enough just saying “stop worrying”. That kind of reasoning will never catch the thief who has robbed our joy. It takes more than good intentions or a positive mental attitude to overcome it. If anyone had an excuse for worrying it was Paul. His friends at Philippi were disagreeing with one another, and he was not there to help them. On top of all that, he didn’t know if he was going to live long enough to see them anyway. Paul had every good reason to worry, and you and I do too, but he didn’t and we shouldn’t. The antidote to worry is prayer, conversational prayer, spontaneous prayer, regular prayer to the God who is near. But it is not prayer itself but the one to whom we pray that takes away our anxieties. Remember when you were first given the Highway Code to read? Why? Why did you study the Highway Code? Because you wanted to pass your driving test? No, that’s not the reason you internalized the Highway Code. Well, if it wasn’t to pass my driving test, it was because I wanted my first car. No, that was not the right reason either. OK, I understand – it was so that I could learn to drive. No. That’s not sufficient reason either. Well then, I wanted to learn to be a safe driver? Nope, not even that. So that I would not be a hazard to other road users? No. None of these were the ultimate reason you learnt your Highway Code. Not to pass your driving test. Not because you wanted a car, or wanted to learn to drive or be a safe driver or avoid being a danger to other road users. You internalized the Highway Code so that you would be free to meet relatives and friends in other places, to visit new places, to go shopping, commute to work and most importantly return home safely. We make the same mistake with prayer. Prayer is not about techniques, or formulas. It’s not about getting what you want. Prayer is not even about prayer. Prayer is simply a two-way conversation with our Heavenly Father, in the name of the Lord Jesus and in the power of the Holy Spirit who is nearer than our breath. Prayer is about listening and talking, using words only when necessary. Our thoughts should be so preoccupied with Him that we are not even conscious of praying, let alone thinking about prayer, any more than when you get in your car, you think about the Highway Code. When you get in your car do you worry about having an accident? When you see a police car, do you worry about getting caught? Not the right attitude is it? If we stay within the broad parameters of the Highway Code we are free from anxiety, guilt and fear. It is the same with prayer. If we are to conquer anxiety, guilt and fear we must stay within the parameters of Scripture, and pray regularly to the One who loves us, who cares for us, who delights for us to be in his presence, and commune with him. The Lord who is near. The reason for praying regularly – anxiety. Paul uses three different words to describe how we should talk to our Heavenly Father. They provide both variety and a rhythm. This carries the idea of adoration, devotion and worship. In verse 5, he has already instructed us to Rejoice – in fact twice. (Philippians 4:5). Prayer must always begin with adoration, for it forces us to realize who it is we are talking to. Its only when we are single-minded that we can adore Him. A while ago I was visiting a local school. I noticed the children addressed the head teacher as “Sir”. A good idea? It shows respect, but it also reminds young people who they are speaking to. We need to do the same. Whenever we find ourselves worrying, our first action needs to be to get alone with God and worship Him. Adoration dwells on the greatness and the majesty of God. We begin worrying when we forget we are related to the One who alone is big enough to solve our problems. Instead of rushing into his presence with our shopping list of requests, the first step is to calmly and in deepest reverence, adore Him. It is then that it is appropriate to share our needs and requests. There is no place for half-hearted, or general prayers. The word ‘petitions’ has with it a sense of urgency, and intensity, of concern. When people came to Jesus, what did he ask them? “What do you want me to do for you?” It is helpful to have that question in our minds when we pray. 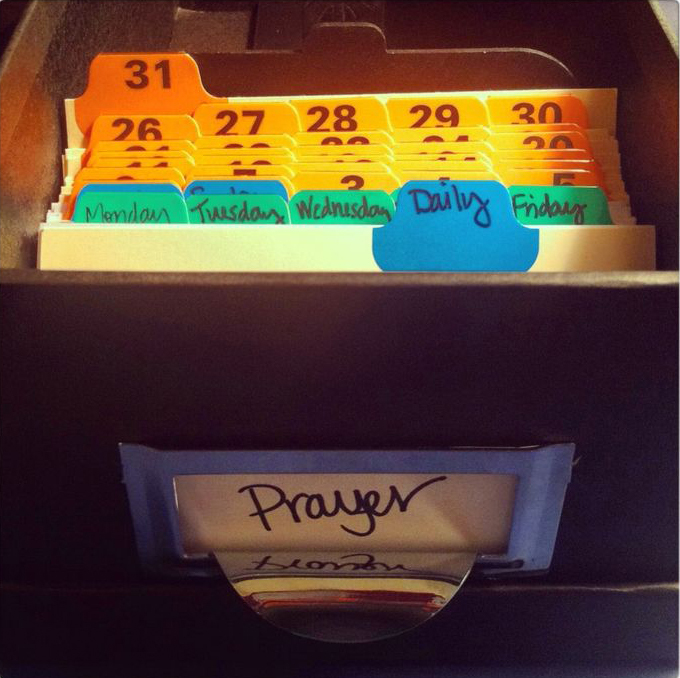 To avoid prayer becoming monotonous, for many years I have used a simple system to enable me to be systematic in daily intercession. You may like to adapt this, print it and keep it in your Bible as a book mark and aid in your own prayer life. Using the Church Family Directory on a daily basis – praying for the people mentioned by name – one page a day – is also a simple but effective method. Our Heavenly Father enjoys hearing us say “thank you!”. It is a sign of our trust and appreciation. Too often we are eager to ask and slow to appreciate. Because we forget His provision in the past, we inevitably doubt His faithfulness in the future. The reason for praying regularly – Anxiety. The rhythm to praying regularly – Diversity. This is our motivation for praying regularly. We will have the peace of God because we have the God of peace. Instead of anxiety we experience victory. Instead of panic we experience peace. The word “guard” is a military term and describes a garrison of soldiers. God will literally guard you with his peace. The secret is not “prayer” as if it were some magical technique to get what we want. That is why I don’t like the phrase “the power of prayer”. You won’t find it in the Bible. We experience the power of God when we pray. We experience the peace of God when we pray. Because we encounter the presence of God, the God of peace, when we pray. Knowing the peace of God does not mean the absence of conflict on the outside, but it does mean a quiet confidence on the inside. Regardless of our circumstances, regardless of what other people say about us, regardless of what the world throws at us, we can experience the power of God, the peace of God and the presence of God when we pray. We may take for granted the privilege of being able to pray openly. The consequences of praying regularly – Victory. This entry was posted in Bible, Sermons, Theology on January 15, 2017 by Stephen Sizer.